Top two pair is normally a monster – but how strong is it after facing a check-raise on a flushed board? In this hand we dissect an uncomfortable hand where Hero has to make some big decisions with Ace Queen on AQ65. In this hand, we’re in middle position with AQ and we open. Saulius in the write-up said that his standard open raise is a min-raise from any position. I’m not going to get into it in this video, but I don’t typically agree with that as a general overall strategy. I think it does a lot of things, leaves a lot of money on the table, and minimizes some leverage points that you’re looking for. But we’re just going to say that this is what Saulius is using overall, so this is nothing atypical for him. End up getting called by the small blind and go heads-up to it. The small blind in this situation has stats of 33/22 with an aggression factor of 1, 3bet of 0, all over 9 hands. So over 9 hands, pretty much all of these stats are going to be 100% useless, so I’m just going to totally ignore the HUD altogether in this video and just essentially treat this person like an unknown at 10NL. Looking for a custom PokerTracker 4 HUD? Grab the Ninja HUD and set it up mere minutes. So we end up flopping top 2. There’s a check. We decide to bet, totally standard, get called. Awesome. Go to the turn, check, we bet again. We bet on the large side, really trying to maximize value from the times that the small blind has something like a naked diamond that they’re drawing for, Ax that they can’t fold, a Qx with a diamond, that sort of thing. And if you think that they’re going to be really inelastic with that, then I really love the large size. But things get a little bit awkward when we face the check-raise here and now we have to make a pretty big decision. This is one of those situations where it’s very uncomfortable, and you have to make a range decision and then you have to pull that trigger depending on what range you’re assigning here. What I mean by that is there’s not a lot of room for you to call here and fold on non-diamond rivers. There’s just not a lot of room in general. This is typically very standard at 100BB play. 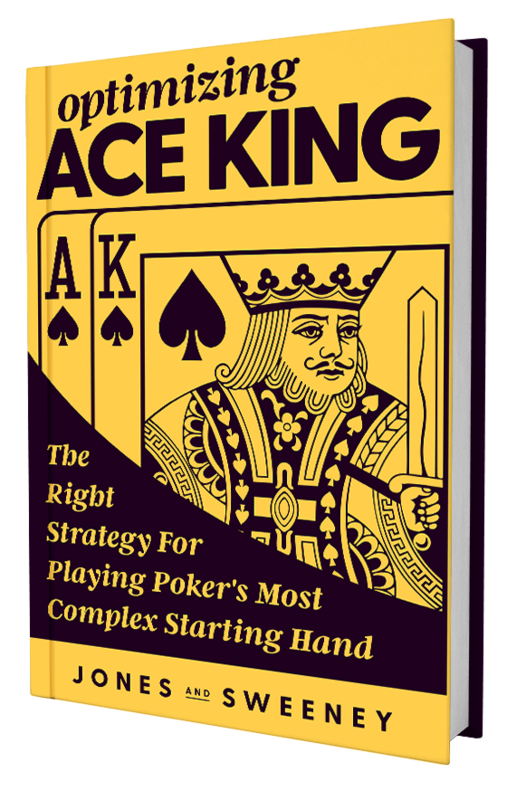 When it comes to facing a check-raise on the turn, you’re typically going to have to make that decision right here, commit it or not commit it. In a situation like this, it’s pretty mathematical, so let’s just break it down. Let’s take Equilab out. We’ll plug in the board, plug in our hand, and let’s go to work dissecting in our opponent’s range. In this situation, let’s just first take a worst-case scenario where all they have is the nut flush or just a flush in general. It doesn’t really matter if it’s 98 or 78 or any of those kind of things. Let’s just plug them all in. That way, we can analyze them. We don’t need to add Ax of it, just because that doesn’t exist. The only reason I’m giving these suited gapper hands is simply because it’s a small blind call. It was only a min-raise preflop, so I think it’s pretty logical to say that these are in there. I’m going to give the diamond combos, going to okay it, going to evaluate it. And, of course, in that situation, we are totally screwed and should just be dumping against that kind of range. We don’t have enough flexibility to call here. We don’t have enough implied odds to try to fill up. So if you think that you are totally hosed here, it’s just time to get rid of it and hate life. Now, obviously, that’s the easy one. The other side of the spectrum is pretty easy as well. Let’s say this person were semi-bluffing a very, very large chunk of the time. So let’s give a lot of hands like all this stuff. We’re just going to give this essentially anything with a diamond in it. Perfect. We’ll give that, do a suit selection, throw a diamond in it. Good. Evaluate it and now you notice that we’re just absolutely smoking that range. Again, on either side of the spectrum, either pole, whether they’re super needy on their check-raise range, or whether they’re super semi-bluffy on their check-raise range, it’s very, very easy. If it’s super-wide, get it in. If it’s super-tight and super-nitty, then it’s time to just dump it right here. In the middle is obviously the more difficult one, and that’s where you have to spend some time and understand how much semi-bluffing is really going on. Me personally, when I look at this kind of range and look at this kind of action, I don’t think there’s going to be a tremendous amount of semi-bluffing going on here. I think if someone is going to semi-bluff, typically, they’re more apt to do so on the flop than they are on the turn after they’ve already check-called. Now, of course, that’s going to be very, very player-dependent. There are some players that love to go for this line, but, typically, they’re easy to spot in my opinion. So it’s just one of those situations where I don’t think you’re looking at quite so many semi-bluffs, so let’s nuke out a decent chunk of those. Now, all of a sudden, we’re in a spot like this, and are there any other hands that reasonably would be in here? Does this person have any other hands? Well, I don’t think they have sets. I think that gets check-raised on the flop. Mind you, there’s really only 66s. I think A6 and AQ also get check-raised on the flop. I don’t think they’re just going to let this board get really, really scary for no reason. I think this is one of those situations where if you don’t think there’s a lot of semi-bluffs, it’s just a situation where it’s really, really close. If you think, Okay, well, I think they’re a little bit tighter. So maybe shave some of those semi-bluffs out even further. Now, all of a sudden, you’re in a really easy fold situation. Not 100% sure how to build ranges in poker? Sign up for the free Hand Reading Email Course and see the ins-and-outs. Here’s the honest truth. I hate seeing folds here. One, because it’s extremely nitty. Two, because if anyone ever finds out that you’re folding this kind of hand here, you’re in a situation where you’re just inviting semi-bluffs and bluffs for the rest of your life/session and it’s going to be an absolute monster trying to dig it out. It’s one of those situations where make your decision, be confident in that decision, do not show your cards one way or the other if you don’t have to, and go forward from there. I think a lot of players, especially in micro-games, especially in full ring games, especially in very passive games, are not going to send off anywhere near enough of the time here. That really puts them solely on flushes. Now, the thing you have to remember on flushes is there aren’t a lot of combos of it. The ace of trump is spoken for, the queen is spoken for, the six is spoken for, which means things like KQ, KJ, AJ, 67, 56 suited, all those kind of things are rinsed out. In this situation, that’s probably going to be semi-bluffs, that sort of thing. Honestly, this is an unknown. It’s a really, really gross decision. I’m not going to fault you one way or the other. I’m more likely just to punch it in here and say, “Okay, maybe you’re messing around. Let’s find out.” In the worst case where they were not messing around and we get it in against the flush, we still have some equity, which is all well and good. Typically, my major strategy is to make sure that I’m not folding too often. So unless I have information to confirm that this person is really, really nitty, or whether this person is really only going to show up with flushes in this exact situation, and usually just going to give some credence to could be messing around, could be overvaluing, could have A5 and could be doing this, whatever it is and I’ll typically just stack it. I’m usually not going to call, so I’m going to shove exactly like hero did. Unfortunately, we end up running into a flush and it is what it is. But this is a really, really interesting hand in a really, really tough spot. But it really boils down to what your assumption on that check-raise range. Again, there aren’t a tremendous amount of flush combos that are possible, so are there enough other things?